Duane Rutter is rightfully one of the most respected singer/songwriters around. Armed with an incredible backing band, he now has a reputation as one of the most rockin' Americana/Country acts in Canada as well. 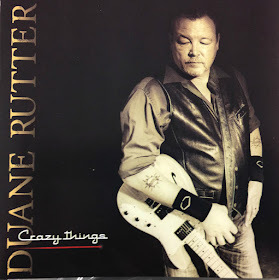 You can hear this new, fuel-injected sound on his latest amazing CD, Crazy Things (released through Busted Flat Records). Without sacrificing his usual beautifully crafted, rich songwork, Duane's souped up his tunes with infectious grooves and powerful guitars. It's a perfect melding of lyricism and cool riffing. A couple of graceful slower tracks show off the band's chops as well. Joining him on his new quest are his current bandmates Andrew Aldridge (guitars/Producer), Carrie Ashworth (bass), Steve "Honeyboy" Wood (pedal steel), Nick Burson (drums), Lisa Winn (vocals) and JB Reed of Human Orchestra (vocals). Guests on the top notch album include Mark Lalama and Garth Hudson of The Band (both on keys) as well as "Sister" Maud Hudson (vocals). Mixing is done by the legendary Nick Blagona. So if you're looking for an album to that'll put a spring in your step, you can pick a copy up at any of Duane's live shows (including the upcoming CD Release at the Casbah on October 10, 2015). CDs can be purchased at Encore Records in Kitchener as well. It can also be downloaded using iTunes.